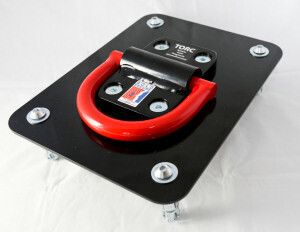 More on the Torc Series II Ground Anchor. The Torc anchor floor fitting kit uses top quality resin capsules for maximum security in good condition concrete floors and walls. It is not suitable for poor quality concrete or concrete that is not thick enough or that has voids or air gaps within the concrete itself, where either the Injection Resin or nominal Brick Wall or Block Wall kits are better able to cope (but their performance will be limited by the poor quality concrete and a location with better concrete is preferable where possible). Note that none of our kits are suitable for fixing to paving slabs or block paving (click for more explanation). The Torc anchor Injection Resin fitting kits use top quality vinylester resin for maximum security in variable condition concrete, brick, block and other substrates including with modest voids/air spaces. 150ml Kit: Fischer FIS-VS-150C Vinylester resin cartridge with mixer nozzle (or equivalent) Note: Strong skeleton gun required to use this cartridge! 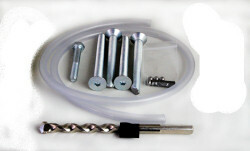 As well as being suited to installation on brick walls, the nominal Brick Wall kit can be used on mediocre quality concrete floors where the concrete is not thick enough or where there are voids or air gaps within the concrete itself, either of which preclude the use of the normal Concrete Floor kit with its resin capsules. However, any ground anchor using expanding bolts should not be fitted to a wall within 2.0 metres (6 feet) of its top edge - do not fit it to a low garden wall! Similarly, you should choose a location that is at least 0.3 metres (1 foot) from the nearest end of the wall - don't fit it close to an external corner. This is because the expanding bolts exert a significant expansion force on the structure of the wall when the bolts are tightened up and this can cause bricks and mortar joints to split apart. The weight of the wall above the mounting point resists this expansion force. Please note that none of our kits are suitable for fixing to paving slabs or block paving (click for more explanation). A test tube brush is not included in this kit but is available from our Extras section. This brush can help to get the holes clean, thus improving the grip of the shields. The base/substrate to which the Torc anchor will be fitted is invariably the weak point. The Torc anchor compensates for this by using multiple fixings and by spreading them out over a larger area. However, blockwork walls and especially lightweight insulation blocks/breeze blocks are very weak and the normal Torc anchor is not recommended for those situations as a result. The Block Wall fitting kit extends the range of suitable bases/substrates by using a much larger mounting plate and a total of 8 fixings! It can be used on other poor-quality substrates, such as poor concrete or poor brickwork where a larger mounting area is considered necessary to achieve a good anchor. Notwithstanding this, and as mentioned above, the Block Wall kit uses expanding bolts and should not be fitted to a wall within 2.0 metres (6 feet) of its top edge or within 0.3 metres (1 foot) from the nearest end of the wall. 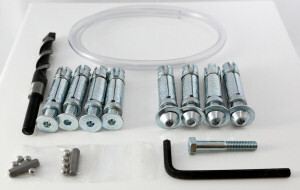 This kit uses a total of 8 expanding bolts so it needs a good height and weight of wall to accommodate the expanding force from all these bolts. 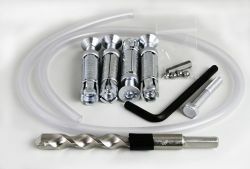 If you are going to be laying fresh concrete then the Torc anchor Concrete-In fitting kit allows you to install the anchor as part of the process of laying the concrete. This means the whole process is completed in one operation. Various of the other fitting options can be used on new concrete, after it has hardened, but the hardening process should ideally be left for 4 weeks before fitting an anchor. If it is all done as part of laying the new concrete itself, there is no need for the delay and the process overall is simpler. If you already have an area of good-quality concrete you can use, the normal Concrete Floor fitting kit is easier than laying new concrete. Laying fresh concrete and using this fitting kit is the recommended approach if you want to install a ground anchor into an area of paving slabs, block paving, or similar. Fixing to slabs etc themselves will not work! 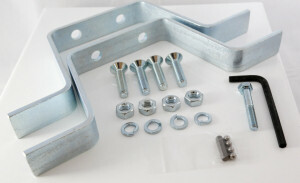 The Concrete-In kit includes an extended mounting plate and also some specially shaped metal bars and fixings that allow the parts to be assembled and then sunk into the wet concrete in one piece. 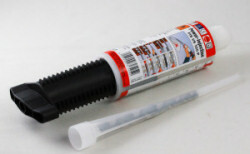 This achieves an excellent fixing without too much additional effort beyond laying the concrete itself. In the photo of the assembly, to the right, the shaped legs will be surrounded by concrete when the anchor is installed - they are not exposed in the final arrangement! Hole size: If you are cutting into an area of poor quality concrete or soil, for example, the absolute minimum hole size needs to be about 250mm x 300mm and the final thickness/depth of the concrete should be 150mm or more. The larger the slab of concrete, and the better it is keyed-into the surrounding soil etc, the better the anchoring effect. (You can key-into the surroundings by undercutting the hole slightly around its edge, so the hole widens as it goes down deeper.) There is more guidance in the instructions supplied with the kit. 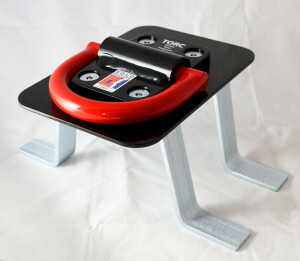 Note that the Metal Shed Shackle is also useful for installation on thin-walled metal structures such as bike safes etc. It reinforces a larger area of the wall than the Torc anchor Van fitting kit, but it also needs a larger flat area for it to be suitable.